Do you want to know how to increase sales and improve customer service? Are you an owner of a dive business, a store manager, or an existing employee who is looking to tap into the full potential of EVE? 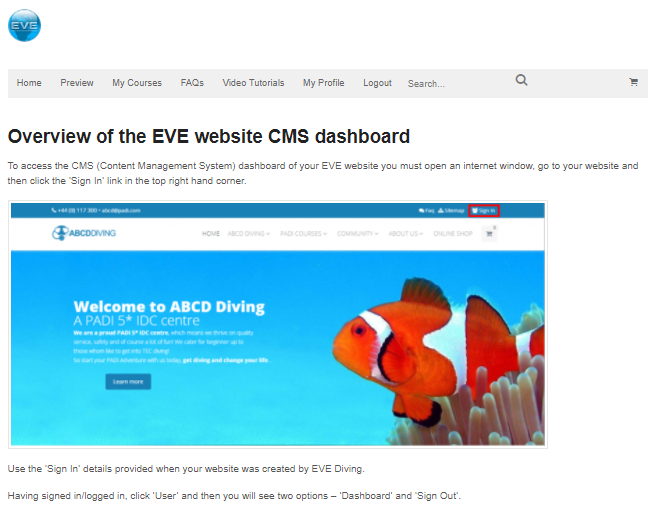 If the answer to these questions is ‘YES’ then the eLearning courses prepared at the EVE Academy, will unlock the power of the EVE Diving systems to take your diving business to the next level. The lessons have been designed so that you can progress through at your own pace using a responsive web design that is mobile friendly. Information is delivered using clear learning objectives, text, images and videos and lessons can be taken and, or reviewed at any time. Each lesson has a clear learning objective and quizzes are used to show the student has developed mastery of the subject knowledge prior to progressing. Make sure you are not missing out.